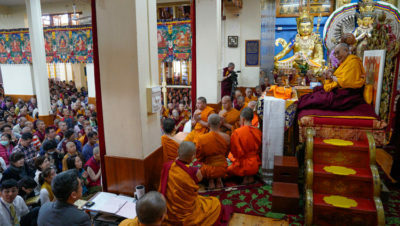 October 5, 2018, Thekchen Chöling, Dharamsala, HP – After reaching the Tsuglagkhang and greeting members of the audience this morning, His Holiness the Dalai Lama stood on the throne and saluted the images of the Buddha, Avalokiteshvara and the Three Religious Kings of Tibet before sitting down. Chanting of the ‘Heart Sutra’ in Chinese followed the recitation of the Mangala Sutta in Pali. “Years ago in Singapore,” His Holiness began, “I attended a ceremony at which elderly monks recited the ‘Heart Sutra’ in Chinese. I was much moved to think of how the teachings of the Buddha had once spread in China and wished to do whatever I could to help revive that tradition. 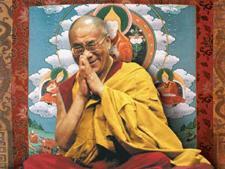 “More recently, I met Buddhist monks from several countries in Delhi. Having explained that I dislike formality and prefer to be open and straightforward, I told them I sometimes ask whether religion is still relevant in today’s world. My own feeling is that it is, because all religious traditions commend the virtues of compassion, something we all continue to need. “Like animals we human beings have sensory consciousnesses, but we also have a marvellous intelligence on the basis of which we can achieve happiness. Most people, however, underestimate their mental potential and instead seek pleasure in sensory gratification. When the mind is disturbed, sensory pleasures will not set it at ease, but if you have peace of mind, whatever goes on outside you will be much less upsetting. We have to use our intelligence to the full. “Cultivating concentration and insight resulting in wisdom is part of ancient Indian tradition. Other religious traditions recommend cultivating self-discipline, tolerance and so forth, but Buddhism specifically advises applying our intelligence to transform our minds. We all have the opportunity to use our intelligence to achieve happiness rather than making trouble. His Holiness observed that there are specific meditations to counter specific mental afflictions—contemplating repulsiveness, for example, is an antidote to attachmen—but the antidote to all mental afflictions is the realization of selflessness. He cited verses 224-226 of chapter six of ‘Entering into the Middle Way’ in praise of conventional and ultimate bodhichitta, which Nagarjuna describes as the source for the accumulation of merit and wisdom that ultimately give rise to the Truth and Form bodies of a Buddha. In terms of truth conventional, they move into cessation. For those who drift, protectorless, they cultivate compassion. Are henceforth overshadowed by their wisdom. Taking up the text again, His Holiness resumed reading from where he stopped yesterday. Pausing here and there to comment and clarify he made steady progress. When he reached the end he urged his listeners to dedicate the merit of becoming acquainted with the profound view to enlightenment. Before leaving the temple, His Holiness announced that tomorrow he will explain Je Tsongkhapa’s ‘Three Principal Aspects of the Path’ prior to giving the permission of Avalokiteshvara Who Liberates from the Lower Realms.